I really like this game, it combine a very good strategy game with a touch of RPG. Its really cool. Very nice. I found it pretty difficult and I'm not quite sure I understand what all of the differences between the monsters effects are, but I think it is brilliant. The diagonal dissolve is cool. Also, I noticed what looks like a table of monsters stats in the tile map. That is a clever way to store data in limited memory. Wow, lots of cool things to learn from here. Benjamin, would you mind pointing me to the line number where you implemented the red screen wipe? 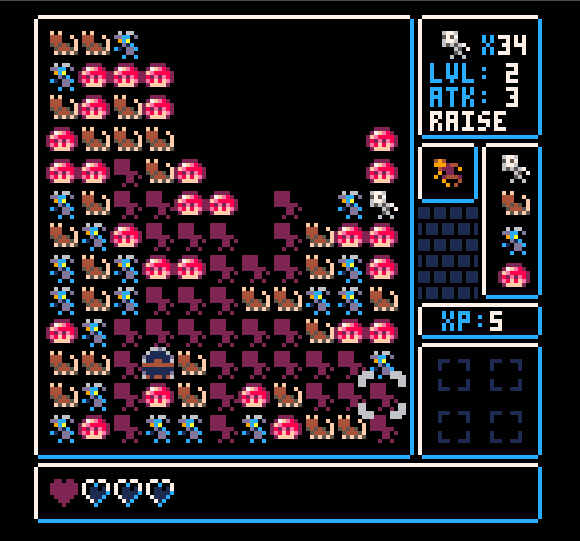 Also, I think this earns the distinction of being the first PICO-8 game that is compelling due to it's own design, and not simply because it exists on a fantasy console. This game is genuinely clever. It has an amazing amount of depth, and I'm pretty sure I haven't seen all the monsters and items yet. Once I started understanding the mechanics, I really started enjoying it--deciding between different groups of monsters, working out how much XP each monster would give me. The armor items are very powerful, by the way--surprisingly so. Probably because the attack items don't give experience for monsters defeated with them, so you can't just use the fire wand on a bunch of particularly tough monsters and get their experience points. 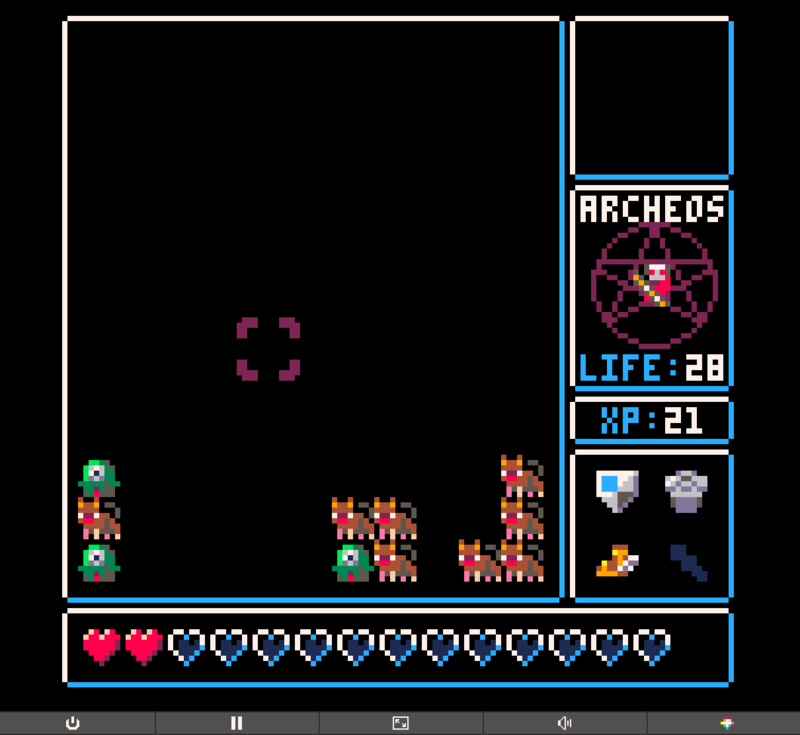 @mx.Bug: You do not hit Archeos directly, you kill the monsters around him (think of him like a door or chest). If you kill him the game will become unwinnable and you will have to reload. Be careful with the glue guys, they WILL force you to have to kill him if your cursor gets glued to him. Totally just /smoked/ Archeos. You are my game dev idol, Benjamin. Incredible! Whoa! I'm so impressed by what is being done with this tool. I'm all over this. EDIT EDIT: I have now recreated a bug where sometimes you level up after using up your HP and you get Game Over, even though your health refilled. It only happened when I had the ring of +1 XP per fight. This game is freaking addicting. I want a PICO-8 emulator for my iPhone so I can play it wherever. So, another apparent bug... I got to the final boss, I clicked him because I had clicked a "glue" enemy underneath him and I had to click him, and he disappeared. I couldn't damage him, and I kept clearing the monsters and refilling my health until there weren't enough monsters to continue. Once I finally drained my health, the game got stuck on the flashing empty hearts and didn't go to "GAME OVER". ANOTHER EDIT: So according to the comments if you click the boss he runs away and you're stuck with an unbeatable level. If clicking him ends the game, he should be un-clickable. It's not a fun thing to discover, that if you try to click the boss you're screwed and you have to try again. It took a while but I beat it. Pretty darn satisfying I gotta say. 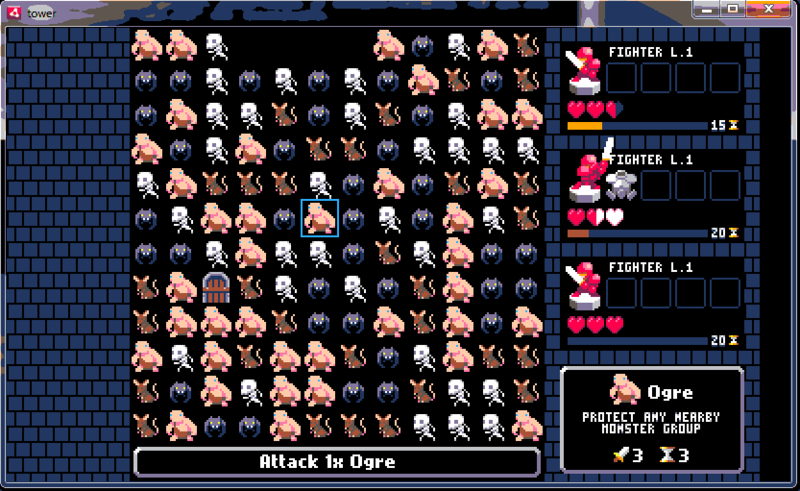 I don't think I beat a single level with those PROTECT monsters, though. They're probably OP. I'd love to know what other players think about it. I don't know if I'm not getting the rules or there is a bug in the game. 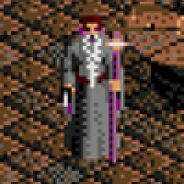 The cursor highlights different kinds of monsters and are all seemingly unrelated to what I'm pointint at. And now the screen is completely empty of monsters and there is nothing to do. 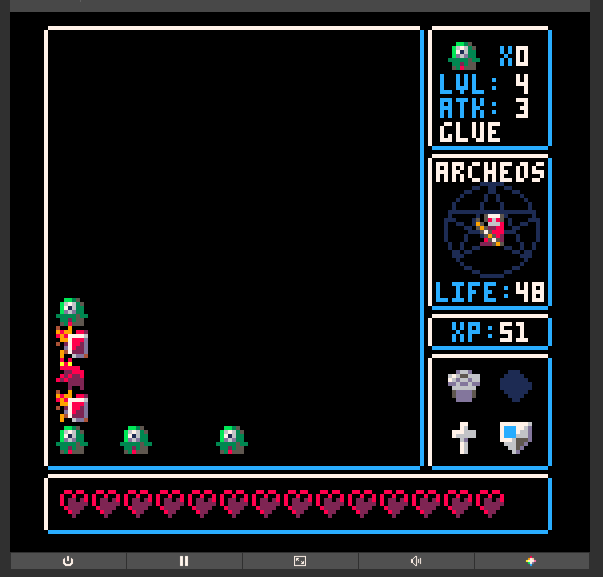 I can still move the cursor around and at some positions it seems to find targets, calculates my resulting life etc but at the top right corner it shows X 0 (as in there are no monsters of that type in the field). oh yeah something has majorly screwed up since last time I played this. I had the same problem as Diego. This is my bad -- the web player was supposed to inject the legacy api implementation for TOA because newer versions of del() and add() behave differently; they both assume packed arrays (i.e. no nil gaps). EDIT: removed, as the head post's version is fixed. Thanks for fixing this! I really like the way you've stacked the ideas from several different games together. It took me a little while to dial in, but once I did I really had fun. Haven't won it...yet! Finally defeated the Archon! This is a fabulous game, thanks so much for making it! What does the chest, which says "-1 on upper level" do? I haven't been able to figure out what "upper level" means. didn't click him directly. guess fire makes him run away too? OH DANG that remake is looking good, I'm definitely interested. I still replay the PICO-8 version sometimes, so a sequel sounds awesome. can't select archeos to kill him anymore. can't use rod of ice/fire on archeos. arrow now inflict damage on archeos rather than kill him. Cool the graphics remind me of the original gauntlet arcade - very stylish, well done! Great job! :D This version plays wonderfully, has great art extensions, and some much needed features imo. =ω= I'll post any bugs I happen upon, but your work is usually pretty solid! The only reason I'm not permanently stuck here because of that fairy, is because I can use my Hammer to avoid triggering its ability and the Floor Clear Bonus gives me an extra key. How do you like working with Haxe? Is it a big learning curve? I'm looking into potential game engines. I want to thanks the pico8 community and also zep. 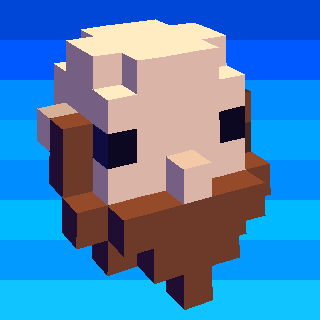 Pico8 is a wonderful tool for prototyping games. I plan to release on mac too. The reason is I dont have a fulltime access to a mac computer. managed to hit floor 8 on difficulty 0 tho. progress! I bought it on itch.io when I could, randomly saw it had a Steam key just now. Congrats! Aww darn, all the codes have been claimed. 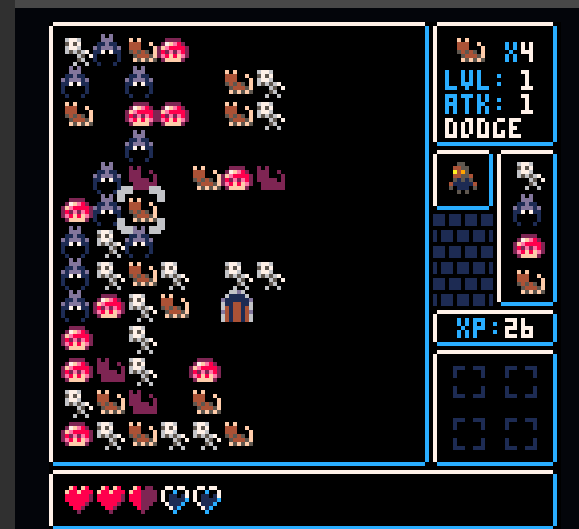 This is definitely one of my fav pico-8 games.